What could be better than the passion of flamenco, the sparkle of wine, the sizzle of paella and time with your friends? I just got back from vacation but am so ready to embark on my mini-break to Spain. How? By attending the Catalan Festival at Gloria Ferrer this weekend. See you by the BrixChickMobile! The Summer of Riesling continues as we celebrate July's 31 Days of German Riesling. 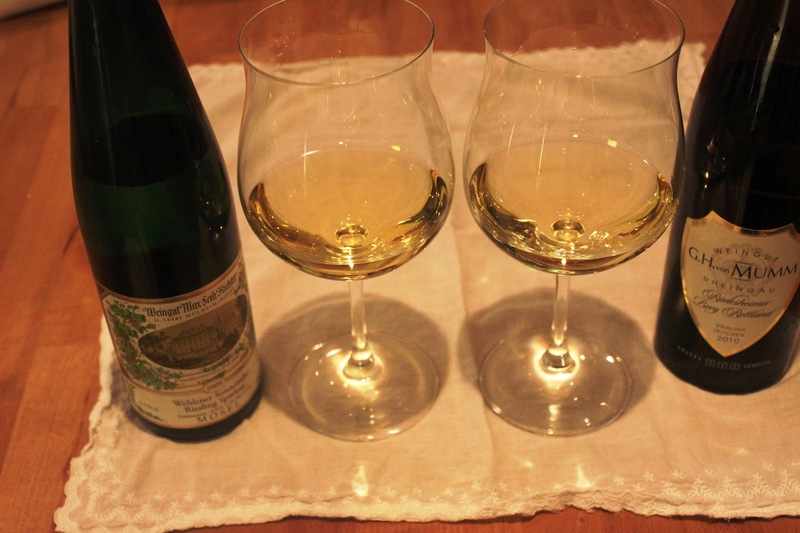 Having just returned from Santa Barbara County where Rieslings are as beautiful as denizens of Manhattan Beach (and as rare as those specimens among the rest of us), it's fun to turn to two examples of German Riesling waiting on my sample shelf. One trocken, German for dry, and the other Spaetlese, which is the second level of ochsle or sweetness level of grapes when they are picked. Literally don't fear the reaper on this as acid in German Riesling balances any cloying you would expect and makes the wine very easy to pair with food. The best way to start out a wine destination adventure has got to be by air. When I embarked upon the preconference for 2013 WBC I left from Seattle, got on an un-air conditioned bus and made the trek to Lake Chelan. It was so worth it to explore this interesting and tasty AVA. Only since 2009 has this wine play ground been designated an AVA, but what an awesome spot it is. With conditions perfect for wine, many wineries are now popping up. It is a wonderful destination for your vacation as well. First, we got to boldly go in a pontoon boat, where I had never been before. The aerial perspective was amazing to see the neatly cultivated fields. When we landed, tasting them was even better. Our first spot, as we touched down like geese on a bender, was Rio Vista. Lucky for them, they sell most of what they produce to their wine club members, who get to enjoy visits to this peaceful spot and enjoy the many wines they produce. From there, we were whisked off to a quick change, which was lamentably not enough time to enjoy Campbell's Resort., This wonderful place made me feel like I was in a movie. Midway between "Dirty Dancing" and "Butterfield 8" , every amenity was available and the place looked action packed I expected to see Elizabeth Taylor rounding the corner in search of lost weekend ice. A kitchen, intriguing furnishings and such a calming view await you there. Dinner and an amazing view awaited us at Tsillan Cellars restaurant, Sorrento's. You can see why people come for destination weddings. Spelled as the First Nation's people would spell it, The restaurant focuses on Italian food. It was as yummy as the view was gorgeous. The staff told us on certain nights in the winter you can see the Northern Lights. We were treated to an amazing sunset and a wonderful dinner. As gorgeous as the view and as comfortable as the venue looked, it wasn't the place that jumped out as Best Spot for Wedding. That had to go to Karma Cellars. Not only was the spot very conducive and the staff very informative, but Karma produces some very tasty sparkling wines inspired by true methode champenoise as well as guided by experience, Julie Pittsinger leads the team that learned and invested in the perfect growing region, The big plus for brides to be was not only the venue, the wines and the help from the team, but an great opportunity to buy a case of your wedding wine and open it slowly year by year. Sounded awesome and the wine was delicious. More Here but take my word, you have to visit an try to truly appreciate. did a wonderful wine pairing, which I stole for a BrixChicks dinner. The Hard row to Hoe Burning Desire Cabernet Franc is such a food friendly wine and paired with beef and horseradish. a crowd pleaser. Current realeases have transitioned into Petit Verdot. Need to try that! The team make your visit fun and many of the double entendres and innuendo only add spice to your visit. Be prepared for fun. They also make a very tasty Ice Cider or apple wine that is sweet but complex and a great cheese wine---you can never have enough of those! All in all a wonderful place to visit. There are many activities for non wine drinkers centered around the lovely lake. If you are planning a destination wedding, its a pretty easy trek in clement weather, so brides and bridezillas alike take note. With only none weekends to go till Summer ends, cash in those Frequent Flyer miles, pack up the car and relax, explore and discover all the fun that awaits by the Lake. When you walk into the studio you notice flasks and perfume bottles where you can spritz various aromas to help you learn to identify some common ones such as melon, raspberry, butter, and chocolate. There are swatches of fabrics to exemplify different textures you will find in the palate of the wine (ie; silk for Pinot Noir, velvet for Cabernet Sauvignon) all perfect for us kinesthetic learners! Wine videos are being played throughout the studio and you can also use the iPads which have apps especially created to help you learn about wine. Here is where you taste and buy their artisan wine line on tap which includes the Artisan white blend 2013, the Artisan Red 2012, Pinot Noir Clones 2012, and the outstanding Azul-Verde 2012 which is a blend of Cab Franc and Malbec. After you taste you can buy a growler and pick a wine to take home. You can reuse the growler every time you return. They also have a cheese-pairing course for each wine which I highly recommend. They show you how the flavors of the wine and the cheeses really work together. This class really tests your olfactory abilities. You are presented with 10 glasses filled with water and an oil carrying a concentrated aroma such as grass, melon, toast, cherry, etc. You swirl and sniff and try to figure out what exactly you are smelling. As a wine-tasting veteran this was much harder than I thought it would be and I was stumped by a few of these concentrated aromas. Wente also makes a kit in which you can buy the aromas and have your own class. This was a good learning-experience for me. Here you can be a winemaker for an hour and make your own blend of Bourdeaux varieties from the Wente Estate. There were barrels of Cabernet Sauvignon from 4 different vineyards, one Malbec, one Merlot, one Cab Franc and one Petit Verdot. The wine-ambassador guides you through the process as you taste each wine and experiment by blending wines from your favorite lots and finding the right aromas and flavors for your palate. You then bottle it, cork it, seal it with foil and label it. The Xandria 2012 Cuvee. Well, it is mostly Cabernet Sauvignon from the Silva Vineyard and the Smith Vineyard blended with Malbec, Merlot and Petit Verdot. I would love to age my wine but don't think I can wait that long to drink it! Overall I found this to be a highly educational yet hedonistic experience. The wines were delicious and the wine-educators were knowledgeable and fun. Thank you to Wente Vineyards for creating a unique wine country experience perfect for the wine veteran and for the wine newbie. Wente's new interactive wine education studio is open from 11 a.m. to 4:30 p.m. Thursdays through Sundays and by appointment at Wente Vineyards, 5565 Tesla Road, Livermore. Experiences range from wine tasting to blending seminars, sensory evaluation and food and wine pairings. $10-$125. For more information, visit www.wentewinemakers.com. 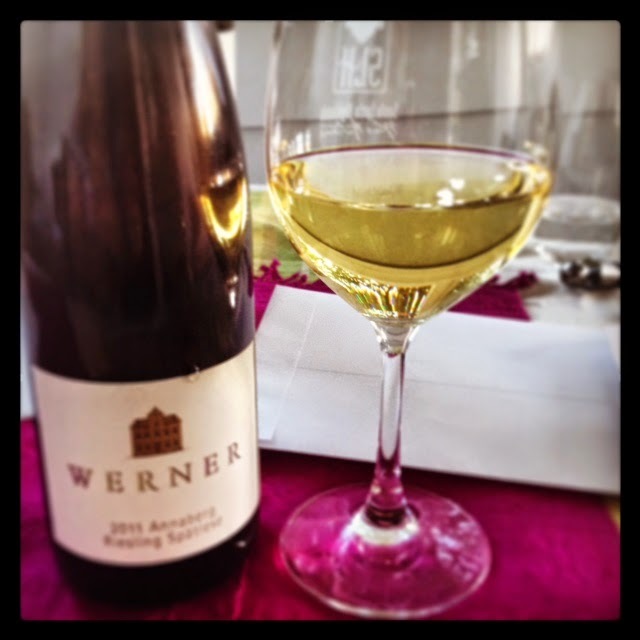 The Summer of Riesling 2014 is here! The Summer of Riesling is a program that celebrates different aspects of this far flung and wonderful variety. Being particularly susceptible,to its charms, I have tried many examples and can testify. But July 1 starts thirty one days of German Riesling events, info and special focus on this wonderful expression of place. 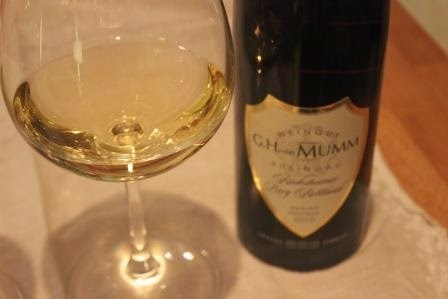 If you are not familiar with German Riesling, you might think it's all super sweet and not what you like. But especially with summertime's super spicy or stone fruit enhanced cuisine, it's the perfect choice. In fact, if you are ever stuck for a pairing idea, chances are a Riesling will pair well with nearly everything you can throw at it. As part of the 31 days of Riesling, in San Francisco, Nancy Oakes modern spot Prospect has two Mosel producers by the glass and snacks to pair. And my favorite, Ella's in Sacramento has wonderful offerings (and Bourbon an bacon delights! )Click to find out where the tour stops near you. Riesling rocks! I was lucky enough to visit thanks to Wines of Germany where I was converted from a casual fan to a total addict. From bone dry to nectar sweet, the natural acidity and careful handling of the fruit grown in the oenological Shangri-Las of Mosel, Nahe and Rheinhessen will enchant you. Take a look at the steep, storybook vineyard shot from a path in the famous Uertiziger Wuertgarten and you get an inkling of the way place contributes to flavor. 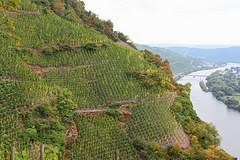 Steep rows, lambent river, implausible slate soil are the ingredients to delicious Rieslings and have been for hundreds of years. It's a place where vineyard workers are not surprised to find Roman artifacts when they work the earth. History is long in this region where nature and nurture combine to coax amazing Rieslings from twisty vineyards and alienesque soil. 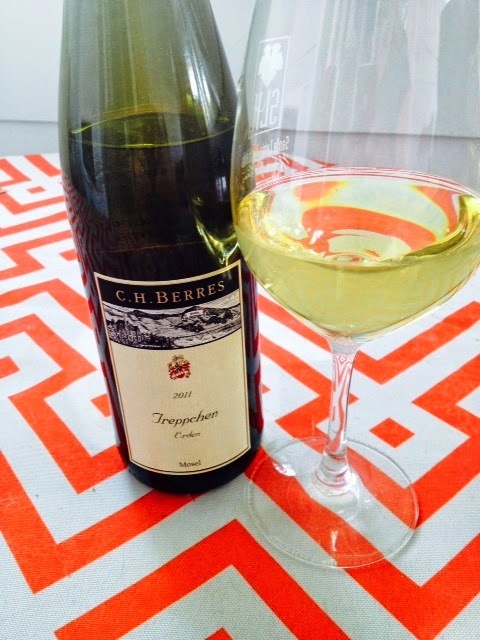 2011 C H Berres Erdner Treppchen Kabinett: This wine came out of the bottle the bright yellow of canary diamonds. It had my favorite petrolly aroma with a scoop of savory coconut and flavors of minerally citrus and lychee. Nice acidity and only a hint of sweetness. It was marked with a 1 on the Sweetness Scale indicating its place on the sweetness scale as dry. Erdener Treppchen translates to "little staircase in Erden", and takes its name from an old staircase cut into the red slate to help the workers. The same red slate takes its color from iron deposits and gives a strong mineral quality to wine made from its fruit. 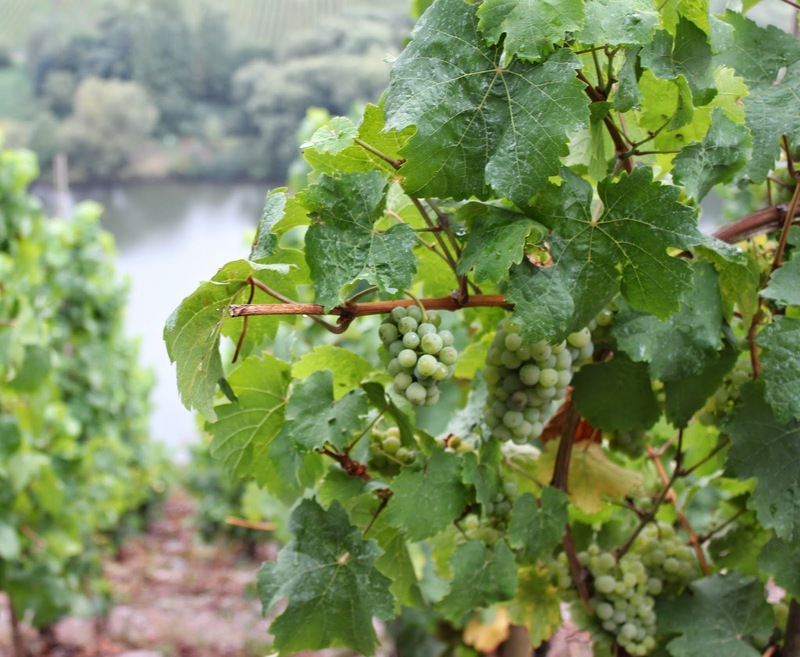 Erden is not far from Bernkastel, where the famous Bernkasteler Ring, or association of growers strive to produce food friendly wines of quality. Our group had dinner with some members and we all fell in love with the producers. I sat surrounded by wonderful producers and was so grateful that my college German had come back enough for me to understand the collegial banter. I felt like a secondary character in a Richard Curtis movie. The stars of the movie definitely would have been Margret and Bernhard Werner, who gifted me with a bottle of their yummy wine. 2011 Annaberg Riesling Spätlese is a lovely golden wine with a silky mouthfeel along with bracing acidity, hint of petrol in nose with stone fruits and honey in flavors. Delectable. 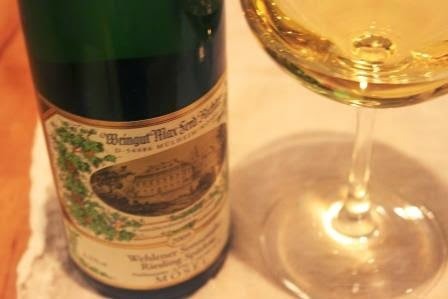 Riesling keeps forever. Just double checking something on the label, I saw a little in the bottle. 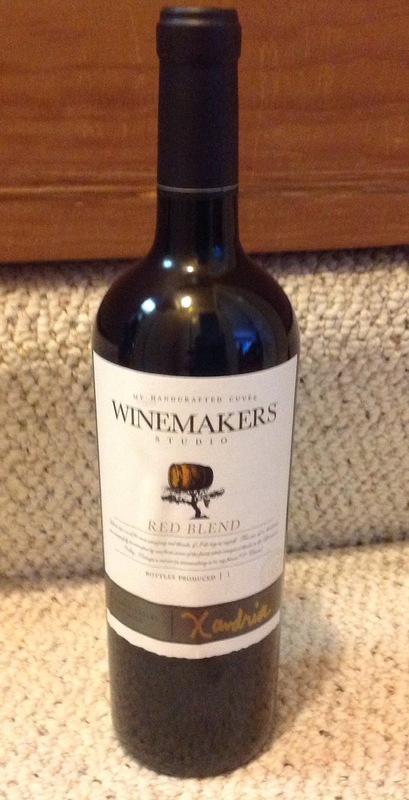 Ever the experimenter I had to try it to see how the wine holds up indifferently stored with the cap even off. Still tasty, albeit not what it was a month ago fresh Miraculous.